Musically there is nothing here to complain about. Renée Fleming has (duh) a beautiful voice. In general, I am not always gripped by her style of acting. Not that it would make sense in this opera if she did, but she never seems to go for ’emotionally raw’ – the effect is always elegant and glossy and often very intense, but never in a “would you like to see the bleeding edges of this character’s soul now?” kind of way. But regardless of dramatic approach this is extremely high quality singing. Rusalka’s song to the moon (or in this case, song to the reflection of a bedside lamp) is stretched out as much as it can plausibly stretch, especially towards the end. Rusalka’s longing and sadness are beautifully done, both in that particular section and elsewhere in the opera; I could listen to Fleming sing this material for a pretty long time before I got sick of it. Robert Carsen’s production contains a lot of doubling. The first thing we see is a room lit in blue. Or rather two rooms, or a room and its mirror image. It is a spacious but anonymous looking bedroom, with a bed, two lit lamps and two chairs next to the doors on either end. The room is reflected as if instead of a floor, there was a mirror – or as if there was water there. 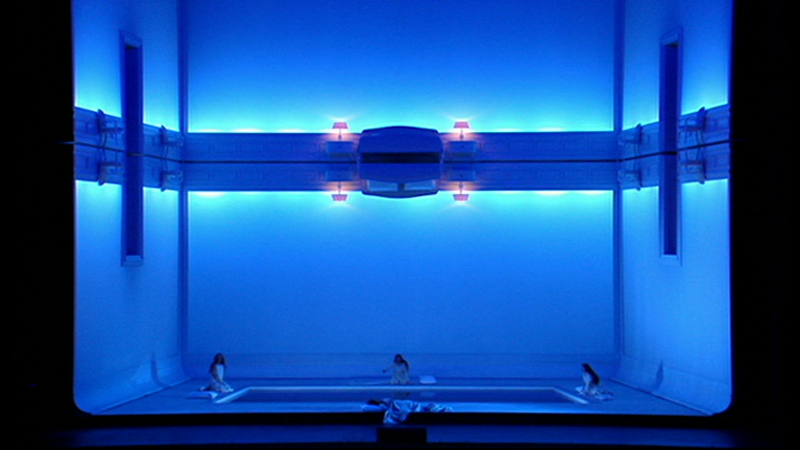 The action in the first act takes place in the ‘inverted’ room below. What would be the moldings linking the walls to the ceiling here curve into the floor; it looks like we are at the bottom of a swimming pool. In the center there is a square opening filled with water.